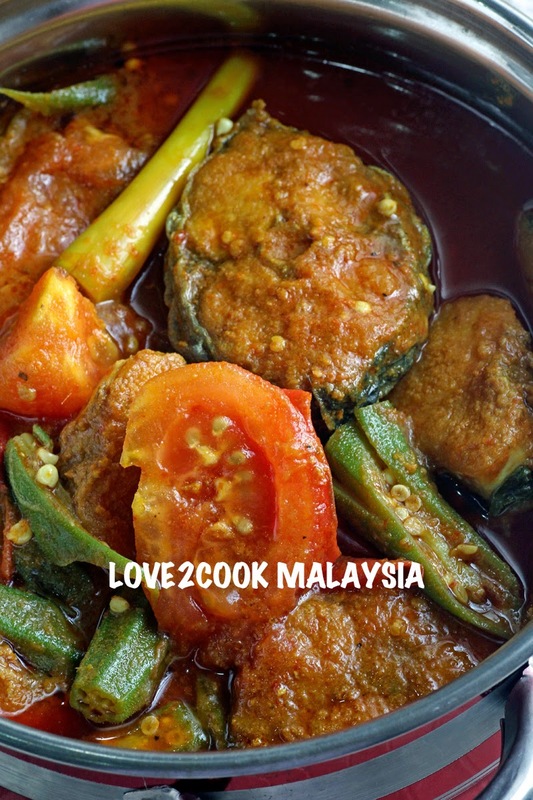 Apologize for my late post on this delicious Asam Pedas. It's one of my family's favourites. We used to have this a Taste Good Restaurant in Bandar Puteri Puchong. 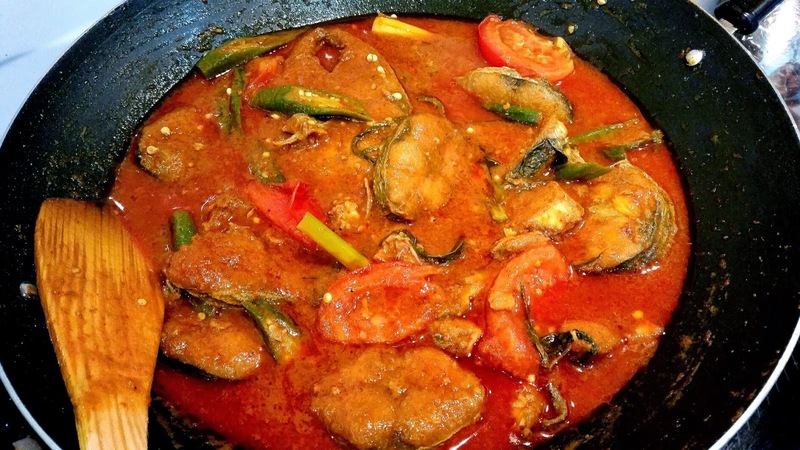 There, the whole fish is marinated with flour and crispy fried prior to adding the spicy and sour gravy. Here, I just used mackerel blocks, rubbed with little turmeric powder and salt. Fry them before making the gravy. Oh, before that! This recipe was inspired from none other than En Adnan Ibrahim a.k.a Che Mat Gebu a.k.a CMG's blog….TIFFINBIRU. 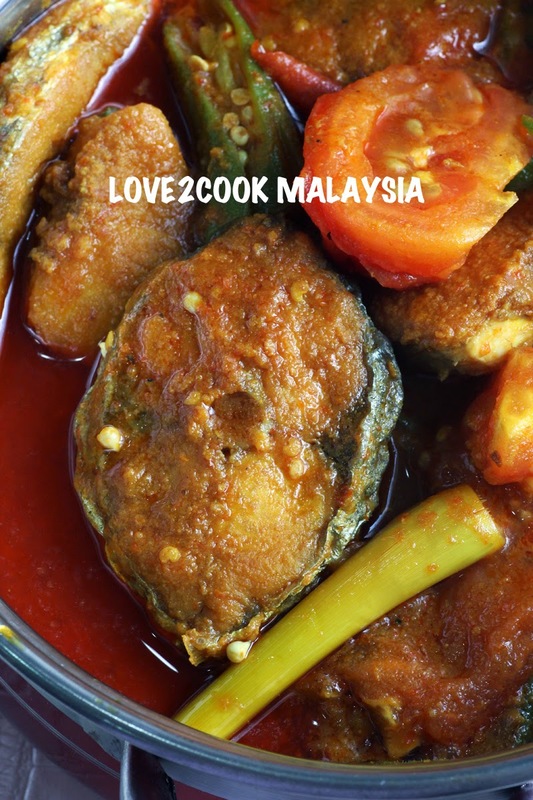 He has a long list of Asam Pedas recipes in his space. Do check them out too! Thank you CMG for giving me an idea on how to make this irresistible dish. I used whatever ingredients I could get, couldn't find the torch ginger bud (bunga kantan) though. Fry the marinated fish blocks in oil until cooked. Set aside. Leave enough oil and sauté the blended ingredients until fragrant. Add the lemongrass stalks. Add chilli paste, stir and leave to boil for a few times. Now, add tamarind paste, ladies fingers, water and salt. Allow the gravy to boil. Add tomatoes and daun kesum. Lastly, put in the fried fish blocks. Give a few boils, check for salt and sourness. Ready to dish out. Enjoy with hot steaming rice! Hi LOVE..lamanya k.atie tak singgah kat sini.Biasa tegur LOVE kat FB jer..hehe.Wuii..sedapnya asam pedas tu...mkn ngan nasi panas mmg best! Sri, your asam pedas looks fantatstic! I will not only eat the fish and vege, I will also drink the gravy!